Since taking office in January of 2015, my goal as the 38th Mayor of Providence has been to build a city that works for all its residents. My administration has made providing year-round educational and recreational opportunities for youth, expanding economic and employment opportunities for all residents and improving city services, top priorities in our work. In Providence, we are ALL IN for education and I believe that every child should have the opportunity to thrive in a supportive environment that inspires them to reach their full potential. I am confident there is no better investment we can make as a city than investing in the future of Providence’s youth. To better prepare residents to be part of a modern economy, I established the Office of Economic Opportunity that provides the workforce, business and job development training and resources so that every resident has the chance to support their family and contribute to their community and our local economy. Residents deserve to see concrete results of how the City is investing their tax dollars to strengthen neighborhoods. That’s why we established a first of its kind Capital Improvement Plan (CIP), which prioritizes public infrastructure improvements in parks, roads and bridges that will keep our City strong from the ground up and allow our communities to thrive. City services should be innovative, efficient, transparent and accessible for all residents and visitors. That is why my administration established the PVD311 system for 24/7 access to constituent services. By streamlining processes, providing customer service training and continuously encouraging city staff to look for efficiencies in all transactions, City Hall has improved our residents’ and businesses’ experiences with all municipal departments. We began this administration with great energy and optimism – knowing that the best days of our City are ahead of us, and that with hard work and dedication we will do incredible things for Providence. Together, we will make Providence a city that works! 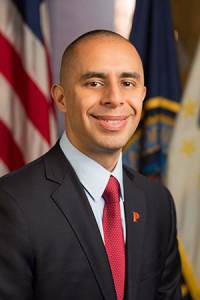 Mayor Elorza believes that maintaining a strong capital city is critically important to maintaining a vibrant and optimistic future for our state. The City continues to put itself on solid financial ground. However, if pro-active steps are not taken, there can be no guarantee that the City will be able to maintain its investments in its most important resource — its people. With that goal in mind, City representatives and elected officials announced the introduction of State enabling legislation that will allow the City to enter into a partnership to preserve the quality and affordability of its water resources while also addressing its long term finances. Fellowships + Internships Fellowship FAQs Fellowship Testimonials Why choose Providence?